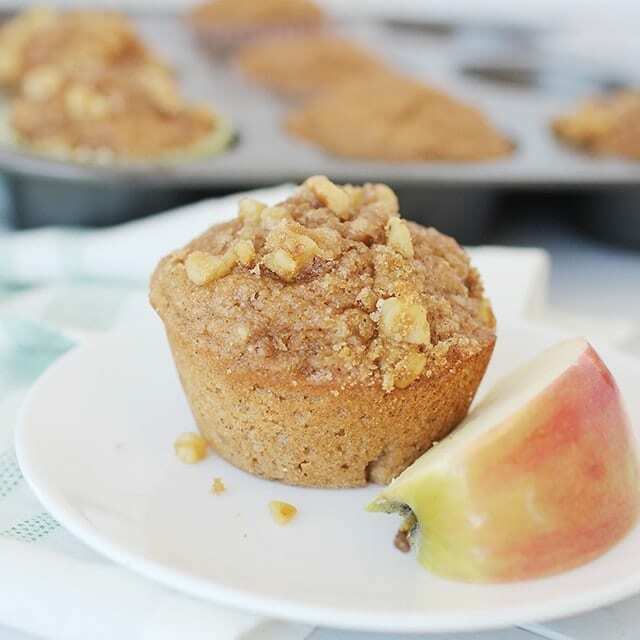 Substitute white flour for whole wheat in these applesauce muffins to increase the fiber and vitamins! 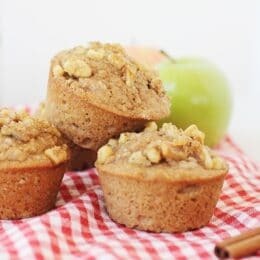 Of all the muffins we have tried, these applesauce muffins are a good one to experiment with if you want to try 100% whole wheat. Whole wheat muffins have a tendency to be denser or heavier, because the gluten develops more slowly than it does with white flour. Whole wheat baked goods also taste a little grittier than the white flour, depending on the type of whole wheat flour you are using. White flour is popular in baked goods because it can create a light and airy product, rather than dense and heavy. But there are other facts that can help develop gluten and help baked goods to rise, even when you use 100% whole wheat. I’ve always taught that you can start with a small amount of equally substituted flour until your family gets used to the taste and texture of whole wheat. 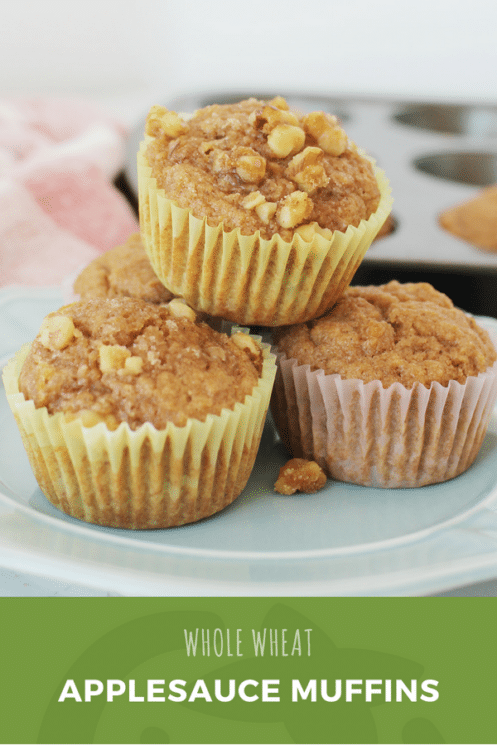 Starting with 50% white flour and 50% whole wheat flour can have less impact on the finished product and give you a muffin very similar to one that you baked with all white flour. However, as you start to move on the scale to more whole wheat than white, you can actually use LESS whole wheat flour. One cup of all-purpose flour can be substituted for 3/4 cup whole wheat flour. Because you are dealing with the whole grain, whole wheat flour doesn’t absorb the liquid in your muffins the way white flour does. White flour acts more like a sponge and sops up all that liquid. So, with whole wheat flour, adding additional liquid can help make the muffins not too dry. While not necessary in muffins, if cooking whole wheat bread, we will incorporate a small amount of gluten to help our whole wheat bread rise. This is easy to do with products like Vital Wheat gluten. White whole wheat flour- One type of wheat kernel that can be milled is called hard white wheat. This is still 100% whole wheat, but the color is lighter, and the flour a little sweeter. Whole wheat pastry flour- Whole wheat pastry flour is made from soft white wheat kernels, and creates a lighter flour, with less protein, which is good for baking. Whole wheat self rising flour- This flour (whether from a white or red kernel) incorporates baking powder sifted into it to assist with baking. 100 % whole wheat flour- This term simply means that 100% of the kernel is present in the flour. 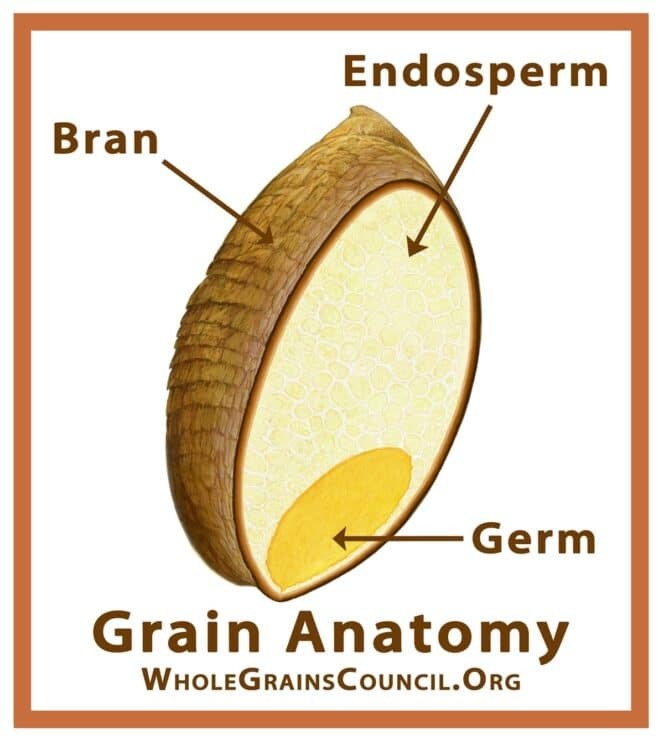 The germ and endosperm are completely milled to create the flour. Whole grain whole wheat flour 100% of the kernel- Again, the full kernel is milled, generally using the hard red wheat kerenel. Whole wheat flour – While sometimes it means the full kernel is milled, only 95% of the kernel is required to label the flour “whole wheat flour”. The bran- the most important part (which is taken away during milling of white flour). This contains the B-vitamins, the fiber, and important antioxidants! The germ- this contains the protein, and even healthy fats! The endosperm- contains the carbohydrate, the majority of the calories, and important minerals. 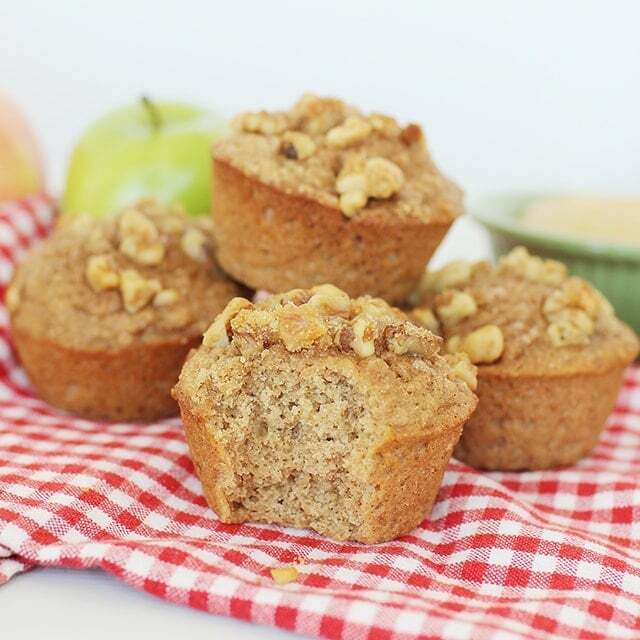 So, if you are ready to start incorporating more whole wheat into your muffins, start with these Applesauce Muffins! Your kids will love them! And to make your own applesauce, check out this canning applesauce post! Mix dry ingredients together in a bowl (flour through salt). In a separate bowl, whisk together eggs, applesauce, and brown sugar. Melt butter; add to wet ingredients and stir to combine. Fold wet ingredients into dry ingredients just until moist. In a separate, small bowl, mix together walnuts and brown sugar for the topping. Divide batter equally among muffin cups, then sprinkle on topping, pressing down lightly so it sticks. Bake for 13-15 minutes or until a toothpick inserted into the center of a muffin comes out clean. Cool for 5-6 minutes before serving. These look delicious, my kids and I will be making these this afternoon! It’s so refreshing to see recipes with real ingredients. Love your site ???? Thanks!! Let us know how your kids like these! My son is allergic to eggs. I have typically used 1/4-1/3 cup of applesauce to substitute 1 egg. In this case i will be using 1.5 c applesauce. Do you suggest adjusting the amount of spices used? Let us know how those adjustments work! The spice would stay the same. What can I replace applesauce with? Will mashed banana be any good? Yes! mashed banana would be great! Hi! making these for the kids now! I noticed in the directions it says to mix the vanilla with the other wet i greditonets but there is no amount listed for vanilla. Just thought I’d let you know. I decided to use 1 teaspoon. Thank you! We actually didn’t use vanilla, so I’ll fix the recipe! Did you end up using it and how did it turn out? I really was skeptical. How could these be good?? But they are excellent! Thank you. I substituted Truvia brown sugar to cut a few more calories. Thank you Amy! I’m so glad you liked them, Jane! Thanks for sharing. Came upon this recipe while hunting for applesauce whole wheat muffins. I’m confused: what does 33/100 cup brown sugar mean? Hi Mary, sorry for the confusion! We made some big updates to our site over the weekend and it caused some technical issues with our recipes. Everything should be patched up now and the recipe amounts should look normal again. Thanks for your patience!